Notes | After 47 years behind the camera Walter Iooss Jr. can't quite put a number on the countless sports subjects he has photographed throughout his career. But whoever the portrait, whatever the setting, a common theme runs through his personal archive: All are athletes lured into the joy of sport. In a 256-page panoramic collection, Iooss handpicks more than 150 of his classic images--dozens never before published--to create a cinematic compilation of his work. For Iooss--whose efforts have graced the cover of Sports Illustrated nearly 300 times--every picture really does tell a story. Here he highlights his favorites with behind-the-scenes anecdotes. For the famous "Blue Dunk" overhead shot of Michael Jordan taken in 1987, Iooss personally painted the parking lot, stationed himself in a cherry picker and waited for the shot. While shadowing Tiger Woods from hole to hole in Carlsbad in 2000, the photographer purposefully wore dark glasses the entire day so as to not look in the golfer's eyes. And in 2003, Iooss literally couldn't sleep the night before reuniting Muhammad Ali and Joe Frazier for their first photo together in 30 years. In a lyrical display, we witness a creative evolution as Iooss continually discovers new ways and approaches to capture the athletic spirit. Iooss's passion, power and perspective are clearly at play in this artful package. Comments | [12/26/08] I just got this book for Christmas. It is amazing. I absolutely love the stories he shares behind the photos. Awesome! 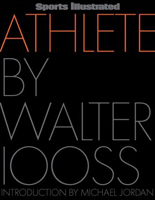 Comments | [10/01/08] I purchased this book because of the comments made by Bert Hanashiro and because nobody can shoot Michael Jordan like Walter Iooss can. It is a wonderful book that reminds me why I took up photography in high school.. Comments | [06/13/08] I just received my copy and all I can say is AMAZING and WOW! If you want some great inspiration, this is the book!